Sometimes extra time in the classroom may be needed for your teen. Deciding whether that time is best served during the school year or the summer months is a decision that many parents have to make. Here are a few things to consider when determining whether summer school is the best option for your child. Summer school is an accelerated program for students. Classes are generally enrolled in for credit, and kids attend class for three or four weeks at about four hours per day. How long you stay in class depends on the number of courses you’re taking. There is usually two sessions of summer school, and your child has the option of choosing one or the other or both depending on the classes they need. Reasons for attending summer school are not all negative. And, even though your teen might think there is no good reason to participate, you as a parent have to decide to help your child to secure their future. 1. They won’t graduate with their class – This is one of the biggest reasons to attend summer school. No teen wants to come down to the wire and realize that they’re short of credits to graduate on time. Summer school can be an option to receive their diploma along with their classmates. 2. They need extra help – Before thinking about summer school, consider tutoring. When a child falls behind in class, tutoring one-on-one may be the solution. If this still doesn’t help, then a summer school session with a smaller class size and less pressure could be an answer. 3. The school counselor recommends it – A guidance counselor is there to help your child complete their high school requirements and prepare for life beyond that. They may be familiar with your child’s records. 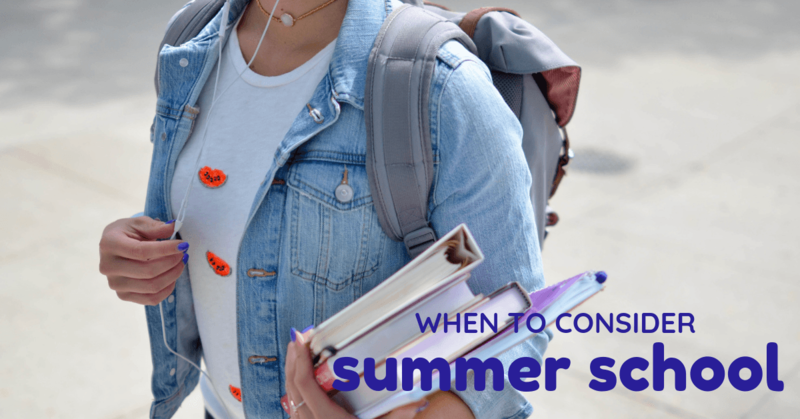 Talk to them to see if they feel summer school is a viable idea that can help your teen. Counselors will also know that poor grades due to disciplinary issues and truancy are not going to get better through summer school attendance. 4. Raise grade point average – College is quite competitive these days. One or two percentage points can make the difference between admittance in the school of their choice and their second or third choice. Adding a class through summer school can raise that average for them. 5. Teachers feel it will serve them well – Teachers work with your child all year long. They know when a session in summer school can resolve academic problems. Many of these educators instruct summer school classes as well. If your child is on the verge of grasping the information but doesn’t have enough time to bring up their grade, summer school can reinforce what they’ve been learning during the year for a solid foundation.